Enjoy casual elegance with a crab and sirloin steak dinner plus the new "My Hawaii - Beyond the Reef' show! After a welcome Mai Tai, explore four panoramic decks for breathtaking views of the Hawaiian sunset and coastline, and complete you evening with our magical show and dancing! All aboard Hawaii's largest and award-winning Star of Honolulu! You're greeted with pier-side hula dancing as you check-in for your sail on Hawaii's largest and award-winning Star of Honolulu! Enjoy a welcome Mai Tai as you pull away from Pier 8 located at the historical Aloha Tower Marketplace. Dinner is served on one of four panoramic decks. Treat yourself to a 3 course crab and sirloin steak dinner (chicken, fish, vegan options available by request) while you sail out toward the world famous Mt. Leahi (Diamond Head Crater). Enjoy live Hawaiian music as you make way way through dinner. "My Hawaii - Beyond the Reef" show has been wowing audiences since its debut. Powerful, colorful and elaborate, they feature the largest cast on isalnd waters with impressive male hula, costumes by a renowned local artist, and state-of-the-art sound and lighting system. Slip outside, at your leisure, and enjoy an unimpeded view of a true Hawaiian sunset and Waikiki beach You may even see some native wild life; maybe even whales during the winter months! As your sail winds down return to your seats inside and enjoy some of the Star's freshly brewed custom Kona belnd coffee with dessert. Participate with the "My Hawaii" cast and dance as the boat returns dockside. 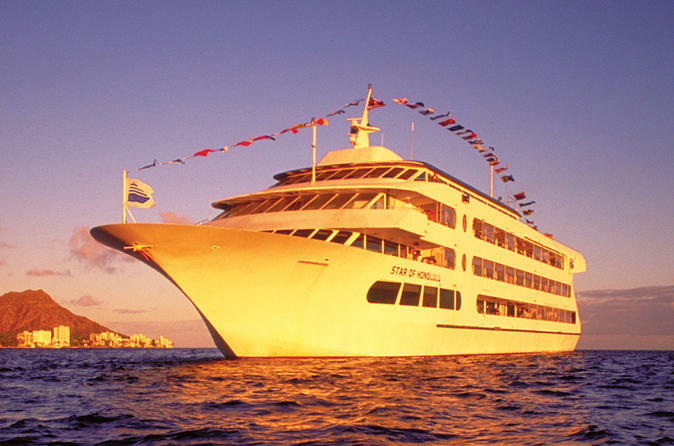 All aboard the Hawaii's largest and award-winning Star of Honolulu!